After Hitlers occupation of Czechoslovakia, the Nazis recognised the advantages of the Small Fortress, and in June 1940 opened a police prison within it. Czech and Moravian patriots, members of numerous resistance groups and organisations, were sent here by various branches of the Gestapo. While around 90% of the inmates were Czechs and Slovaks, others included citizens of the Soviet Union, Poles, Yugoslavs, Frenchmen, Italians, English prisoners of war and other nationalities. In five years, some 32 000 men and women passed through the gates of the Small Fortress. The conditions under which the prisoners lived worsened from year to year, and prisoners were forced into slave labour. The internal komando maintained the prison, tilled the surrounding fields and built various structures. 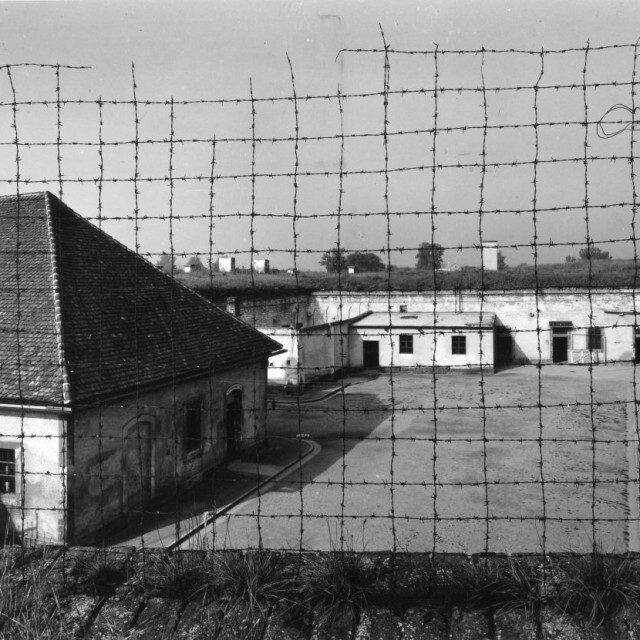 The majority of prisoners, however, worked outside the fortress for various firms in the area, and until the closing days of the War contributed to production and work for the Reich. From 1943 executions, too, were carried out in the Small Fortress, on the basis of Sonderbehandlung – without judicial process. In all, more than 250 prisoners were shot. At the last execution, on May 2nd 1945, 51 prisoners and 1 informer, mostly representatives of the Předvoj youth movement, lost their lives. Only in the evenings, in moments of rest, could the prisoners rise above the never-ending humiliation and terror from the side of their guards. Within their cells, permanent and trustworthy collectives formed that secretly organised political and cultural events. Talks and presentations were held by artists and a broad range of professionals; in some cells cultural evenings were secretly held with singing and recitations, and clerics organised prayers. Even in such inhuman conditions people were able to express their creativity; numerous poems and simple drawings of outstanding documentary value originated here. Culturally, political life in the cells and secret links to the outside world helped the prisoners to overcome the horrors of this tool of Nazi persecution. Among those imprisoned in the Small Fortress were the head of the resistance organisation the Central Command of Home Resistance, doc. Vladimír Krajina, the most senior officers of the National Guard, Generals Hugo Vojta, František Kravák, Viktor Spěváček and František Melichar, and the head of the Czechoslovak General Staff, General Ludvík Krejčí, who was also deported here. Also present were the leader of the Věrni zůstaneme (We remain faithful) petition movement Prof. Vojtěch Čížek, the writer K.J. Beneš, the editor Otakar Wünsch and JUDr. Milada Horáková. Members of the Communist Party imprisoned here included Václav Sinkule, Eduard Urx, MUDr. Miloš Nedvěd, Milada Pixová and Marie Zápotocká. After the assassination of Heydrich in 1942, students from Roudnice were brought here, along with the relatives and accomplices of the assassins, Kubiš and Valčík; of these, 252 were executed in October 1942 at Mauthausen. Other prisoners of note included the Prague radio reporter František Kocourek, the caricaturist František Bidlo, the former Minister of Foreign Affairs Kamil Krofta (a university professor and historian), and prof. Karel Štipl. The Small Fortress had the character of a transit prison, from which inmates were after a certain period either brought before the courts or transferred to concentration camps. As a result of hunger, maltreatment, insufficient medical care and poor hygienic conditions, however, some 2600 prisoners died here, while thousands more lost their lives having been deported from Terezín.